SLAVYANSK, Ukraine -- Antigovernment militants in eastern Ukraine on Saturday rebuffed international calls for the release of a group of European military observers, but suggested that they would consider a prisoner exchange. Detained observers from the Organization for Security and Co-operation in Europe arrive to take part in a press conference in the eastern Ukrainian city of Slavyansk on Sunday, April 27. The military observers — a group of officers reportedly from Germany, Poland, Sweden, the Czech Republic and Denmark — were detained on Friday at a rebel checkpoint at the edge of this city while traveling with a Ukrainian military delegation, which was also held. The observers, known as a military verification team, had been working under the auspices of a document from the Organization for Security and Cooperation in Europe that allows member nations — Ukraine, in this case — to invite other member nations to send observers to examine security conditions. The militants have accused the observers of espionage. Early Sunday morning, a spokesman for the O.S.C.E. in Kiev, the Ukrainian capital, said members of its special monitoring mission to Ukraine, a set of monitors distinct from the detained military observers, would travel to Slavyansk from Donetsk to meet with the rebel authorities. “We’re looking forward to access Slavyansk as soon as possible to play a role in the resolution,” said the spokesman, Michael B. Bociurkiw. The detention of the observers and the allegations led to a day of swift-moving diplomatic developments. Sergey V. Lavrov, the Russian foreign minister, spoke by telephone with his counterparts in the United States and Germany and with the president of Switzerland, Didier Burkhalter, who is also the chairman of the O.S.C.E. In his phone call with Mr. Lavrov, Secretary of State John Kerry urged Russia to use its influence with the pro-Russian separatists in Ukraine to ensure that the detained observers and their Ukrainian guides be released “without preconditions,” a senior State Department official said. Mr. Kerry is opposed to any prisoner exchange, the official said. Frank-Walter Steinmeier, Germany’s foreign minister, said he welcomed Mr. Lavrov’s pledge to help free the observers. Andrei Kelin, Russia’s representative to the security and cooperation group, said Russia would take “all possible steps” to help secure the observers’ release. “We think that these people need to be freed as soon as possible,” he said, according to Itar-Tass. The situation has been complicated by rival interpretations of the observers’ role, in part because their organization has taken pains to draw a public distinction between its permanent mission in Ukraine and the detained military observer team, and has said all of its staff members are accounted for. Rebels have seized upon the organization’s statements to characterize the observers as NATO spies who used poor judgment and entered areas outside their host government’s control without invitation or permission. “The officers we currently have do not have any relation to the O.S.C.E.,” Vyachislav Ponomaryov, the self-appointed mayor of Slavyansk, said in an interview. 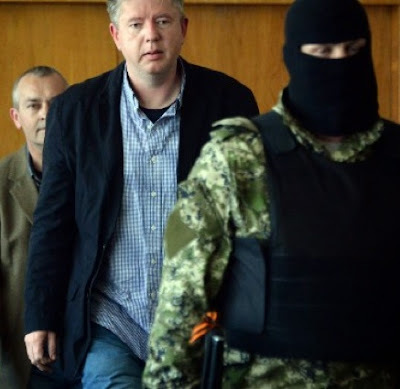 Mr. Ponomaryov brushed off questions about his plans for them, hinting only that he might consider exchanging them for prisoners held by Ukraine, perhaps including his deputy, who he said had disappeared while returning from Moscow and might be in Ukrainian government custody. “If we have the chance to swap them, we will do it,” he added. In a public appearance later, Mr. Ponomaryov said he had no direct contact with Russia about the detainees. Asked whether the statement of Mr. Kelin, the Russian diplomat, might influence his thinking, he answered nonchalantly. “I do not know this person,” he said. A Ukrainian journalist working for Telekanal Zik, a Ukrainian Internet TV station, was also detained Friday, after recording a video report near the city’s main square, his colleagues said. The journalist, Yuri Lelyavsky, from Lviv in western Ukraine, was heard speaking Ukrainian on camera before being approached by men in camouflage and head coverings, they said. Mr. Ponomaryov swept aside questions about him as well, saying only that saboteurs sometimes use journalistic cover. On Friday, armed pro-Ukrainian forces in masks reportedly detained and deported two journalists from LifeNews, a Kremlin-aligned Russian television station. The journalists, Yulia Shustraya and Mikhail Pudovkin, were seized from their residence in Donetsk and driven to the Russian border, according to their colleagues. A statement by the Russian Ministry of Foreign Affairs, released after Mr. Lavrov spoke with the other world leaders, emphasized that Ukraine was holding prisoners, and noted that Mr. Lavrov had been told that representatives of the European security organization had managed to see Pavel Gubarev, a pro-Russian leader in eastern Ukraine known as the “people’s governor,” who had been arrested by the Ukrainian authorities. The ministry also released a summary of Mr. Lavrov’s phone call with Mr. Kerry, saying that Mr. Lavrov reiterated a previous statement that the interim government in Kiev should be held responsible for not “controlling the situation on the ground” or providing adequate security. Ukrainian security forces appeared to tighten the government’s self-declared blockade around the city on Saturday, by establishing at least one more armed checkpoint on a road to the northwest. The blockade appeared to be limited, and did not restrict the flow of goods. Civilian vehicles were allowed to pass after a brief search and document check. “Our objective is simply to make sure no armed people or weapons pass through,” said Sergey, a commander of the Ukrainian Interior Ministry troops at the checkpoint who declined to give his last name. Later in the day, in a crowded auditorium in Slavyansk, anti-Kiev residents appointed a new people’s council loyal to Mr. Ponomaryov. The residents appeared impatient as speakers described how this new government would be organized. Residents also gathered for the funeral for Aleksandr V. Lubenets, 21, who they said died after being shot near a checkpoint that had been attacked by Ukrainian forces. The attack, one man said, only drove eastern Ukrainian provinces closer to Russia. “Donbass, Kharkov, Russia — it’s us,” said one teary-eyed man, Nikolai Nikushin, referring to two regions of eastern Ukraine.